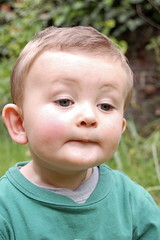 Papa sat me in the garden the other day to take some photographs of me. His motives were selfish though, as he is in California right now and wanted some new photos of me to look at. Boring.